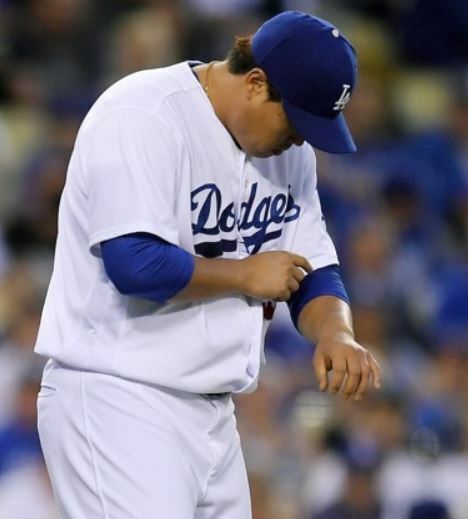 Ryu Hyun-jin of the Los Angeles Dodgers had his start cut short after getting struck in his pitching arm by a batted ball. Ryu left his start against the San Francisco Giants at Dodgers Stadium in Los Angeles on Saturday (local time) after just 2 1/3 innings, after taking a line drive by Joe Panik to his left forearm. Ryu managed to pick up the ball and throw out Panik at first, before dropping his glove and grabbing his left arm in apparent pain. Dodgers manager Dave Roberts came out to check on the South Korean pitcher and took him out of the game for right-hander Ross Stripling. The Dodgers later announced Ryu's injury as a forearm contusion. X-rays on the arm were negative. Ryu left the game with the Dodgers trailing 1-0, after allowing an RBI single to Buster Posey in the top of the first inning. The Giants went on to take the game 2-1, dropping Ryu to 5-8 on the season with a 3.47 ERA. 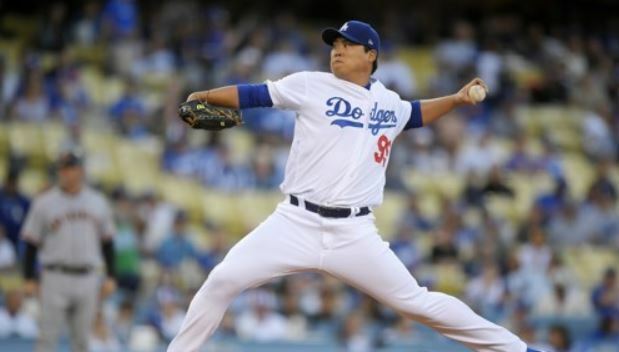 Ryu entered the game on the bubble for a spot in the Dodgers' postseason rotation. Prior to Saturday, Ryu carried a 2.36 ERA in nine starts since the All-Star break. Roberts will likely go with Clayton Kershaw, Yu Darvish, Rich Hill and Alex Wood in his postseason rotation, which would send Ryu to the bullpen as long as his arm injury isn't serious. Ryu missed the entire 2015 season and made only one start in 2016 with shoulder and elbow problems. Ryu didn't report any pain after the game, and he said he didn't think the injury was serious. "I've never been struck in the arm before in my career, but since there's no structural damage, I should be able to recover soon," Ryu said. "I don't know if I'll have another chance to pitch again this season (with seven games remaining). I just have to be ready to pitch as soon as I can."